Cognac, Armagnac, Brandy… different names for a similar product. But certainly not the same. 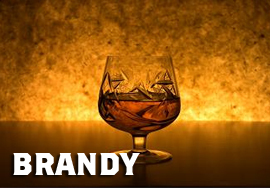 Brandy is a bit of a catch-all that can encompass any spirit distilled from fruit, but it's typically distilled from wine. Grapes. Sweet, delicious, grapes. And then laid to rest in wood for some time. VS- for a minimum of two years, VSOP- for a minimum of four, XO or Napoleon- at least six years, and Hors d'Age- Even. More. Old.